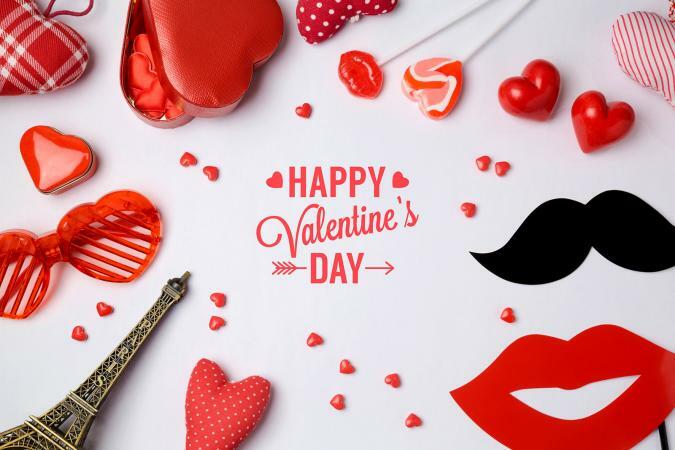 Whether you're preparing for a child's classroom party or having a special get-together with friends, filling the room with hearts, flowers, and other special Valentine's Day symbols can add the perfect touch to your celebration. You can easily make any Valentine's Day party more extravagant by adding just a few simple decorations. Its easy to create Valentine's Day decorations from scratch. Whether you want to make paper cards, hearts, photo frames or even a simple banner or wreath, there are numerous craft ideas to consider. Consider the following crafty decorations for your party. You can welcome guests to your party with a heart banner that says "Happy Valentine's Day" or "Love is in the Air." 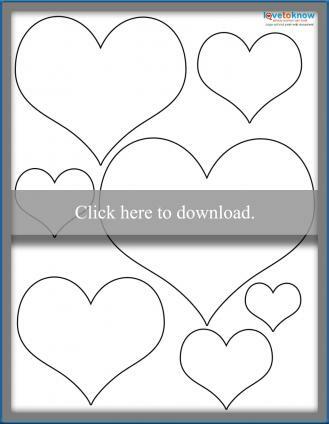 Cut out hearts from the patterned paper. Make one heart for each letter of your message, plus extra hearts for blank spaces. Cut letters from solid colored cardstock, using a free font from your computer as a guide if you're worried about a neat appearance for your banner. Glue one letter to each heart. Punch holes in the sides of each heart. Thread the hearts together with the ribbon. Hang your banner as desired. Beaded hearts are easy to make and very versatile for holiday decorating. By varying the size of the hearts and the colors of beads used, you can create a stunning display. Bend a length of wire into a V-shape. String the beads on the wire into a pleasing pattern. You can use similar beads for a very uniform appearance, or alternate colors, shapes, and sizes of beads for a more eclectic look. Bend the beaded wire into a heart. Twist the ends together with the pliers. 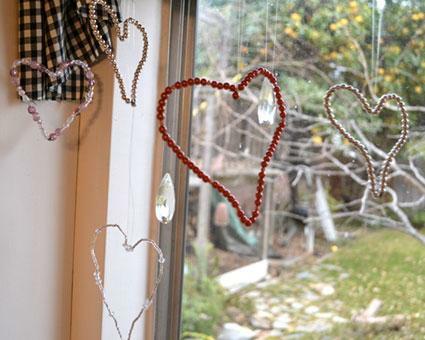 Hang your wire hearts from an open window to make a pretty decoration. A wreath offers a simple way to set the mood for a holiday celebration. This fun project looks good enough to eat! Wrap the wreath with ribbon, using the hot glue gun to secure it tightly. 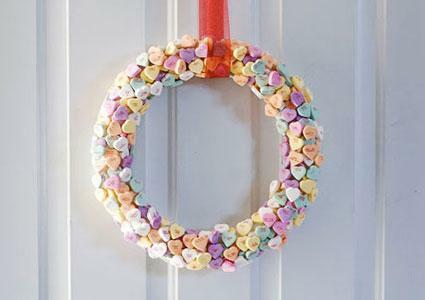 Glue the conversation heart candies to the wreath in a pleasing pattern, overlapping as desired to achieve a festive look. For party planners who are short on time, know that there are a wide variety of decorations available at most party stores. Around the month of February, expect to find decorations almost everywhere you shop. If you prefer shopping online, you can find festive decorations at the following sites. For around $2, you can get a pack of gel window clings. These clings come in a set of 20 and feature hearts and the letters L.O.V.E. Priced around $3, the Red Heart Honeycomb Ball, also available in pink, can be hung from your ceiling or doorway to add a festive touch to any room. For under $1, you can add a festive heart centerpiece to your party table. This centerpiece features metallic strands accented with hearts. 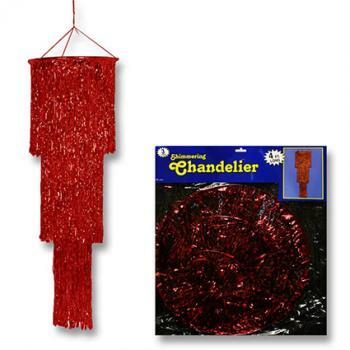 Oriental Trading has affordable party decorations that will liven up any room. Check out the following decorations, which could be perfect for your Valentine's party. Priced around $9, the Heart Light String features 20 plastic heart lights that are attached to a string. Use this lighted string on a mantel, window ledge or even your doorway to add a special touch. For around $11, a Pink Rose Garland will add an elegant touch to your party décor. It can be hung around stair rails or a pole to add a touch of beauty and romance. Priced around $4 for a bag, Heart Confetti features red and silver hearts. Use it to add a glittery touch to any table or buffet. Hang the Red Fringe Chandelier for a dramatic accent to your party. Priced around $12, this chandelier has three tiers and features red fringes. Light up your sidewalk with luminary bags. Priced around $16 for a pack of 50, these bags feature the words "I Love You" and can be used with a battery-operated candle for light. For a special touch, hang Twirly Whirls from your doors and windows. These fun decorations are priced around $4 and are sold in a pack of six. Valentine's Day decorations can definitely add a fun touch to your party. They can liven up a room and turn an ordinary area into something festive and spectacular. Whether you decide to make your own decorations or purchase them, they are sure to be a hit.